Publisher: University of Novi Sad, Technical faculty “Mihajlo Pupin” in Zrenjanin, 23000 Zrenjanin, Đure Đakovića bb, Republic of Serbia. 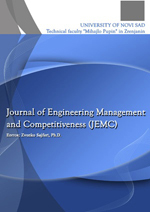 Engineering Management: Management (in general), Maintenance Management, R&D Management, Innovation Management, Quality Management, SMEs and Entrepreneurship, Strategic and Operation Management, Quantitative and Qualitative Methods and Models in Management, Operation Research, Logistics, Simulation, Statistic Models, Economic Models and Econometrics, Risk Management, Human Resource Management, Knowledge Management, Environmental Protection and Improvement. Management and Information Systems: Customer Relationship Management, Data Base Management, Information Systems in Management, Information Systems and Decision Support, Expert Systems, E-business. Marketing Management: Marketing Strategies, Competitiveness and competitive factors, Brand Management, Marketing Management in SMEs sector, Public Relations, Business Communication, Marketing Communication, New Models of Marketing Management, Service Management.